Caen is a city in Normandy, located in northwestern France. 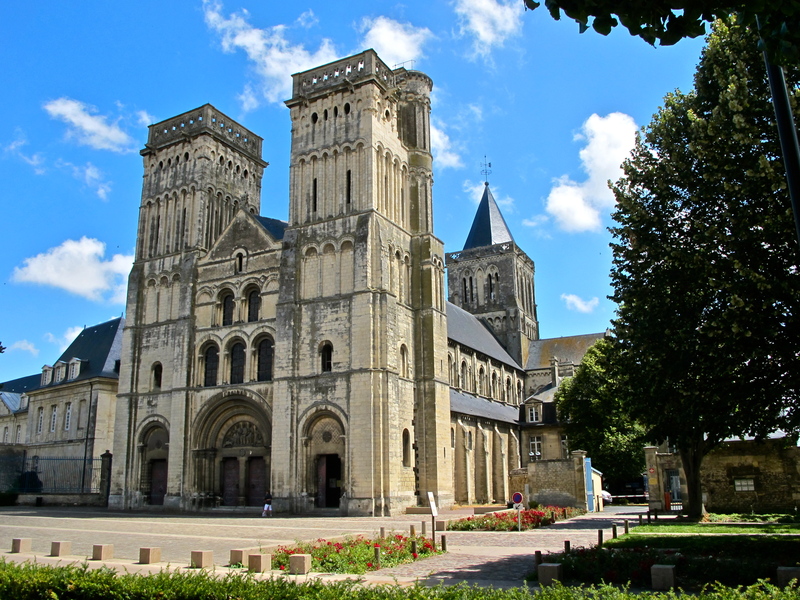 Sometimes the architecture in this region of France and in this time frame is described as "Norman." The name comes from its having been conquered in the 10th century by Scandinavians, and is Old Norse derived from Northmann. It's not until you travel a bit that you find that so many hitherto unsuspected countries have pushed out and taken over other countries. In this case, those Scandinavians came a long way - some say they were Swedes, others the Norwegians. No one wants to assume the mantle of "conqueror" any more. The quarries of Caen provided stone for not only major buildings in Medieval Normandy, but were also used in construction of the Tower of London and Westminster Abbey. 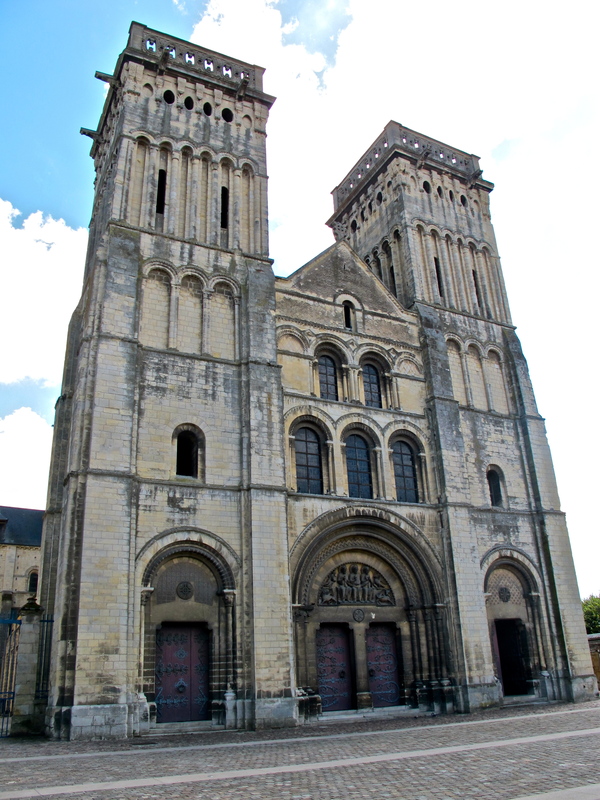 The Abbaye-aux-Dames, a French Romanesque church also known as "La Trinite," was built in the northeast corner of Caen. 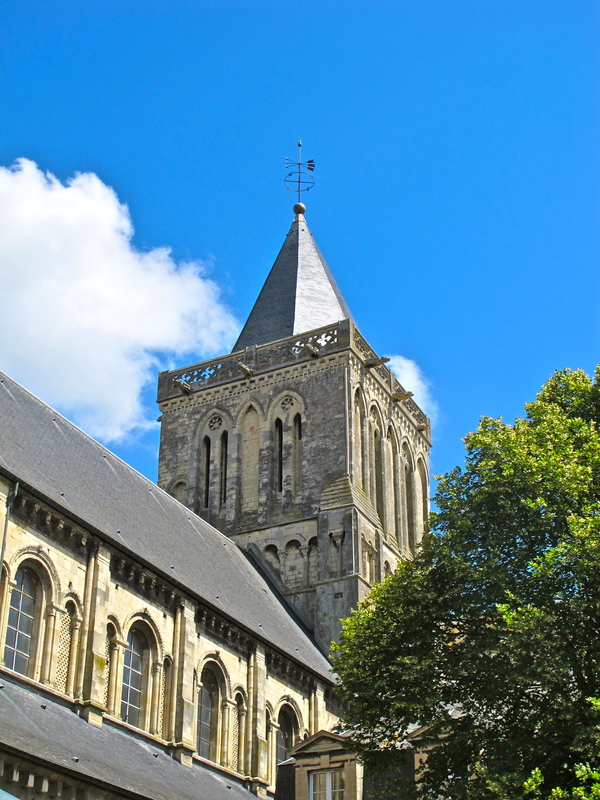 Constructed between 1062 and 1140, this church was founded by Matilda, wife of William, Duke of Normandy. 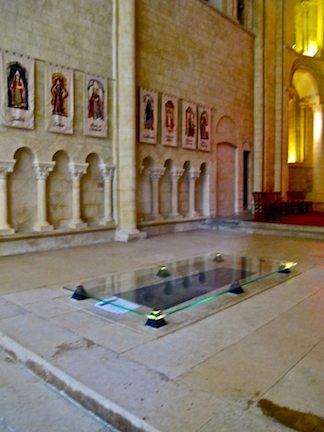 William would eventually be known as "William the Conqueror" because of his successful invasion of England (see the Abbaye-aux-Hommes, begun by William, and also located in Caen - actually on the opposite or west side of the city). The two churches were built as expiation for the sin committed by Matilda and William - they were first cousins who had married. Perhaps that is why their two churches are as far removed from each other as possible, within the city limits. 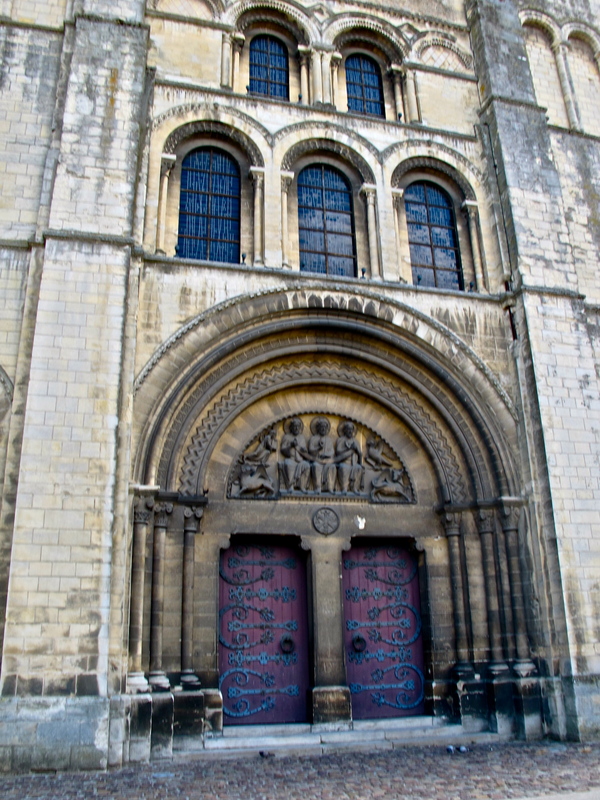 This is the "west" facade - the entrance facade of the church; a bit off of tradition, the facade is actually positioned towards the northwest. The walls are heavy, out of necessity. The taller a masonry wall, the thicker it has to be in order to support itself. To relieve the feeling of heaviness, pilasters were applied to the façade, and arches, forming arcades, begin to appear, and there are more as we go higher. We will see similar designs in Pisa and Modena, areas of northern Italy seemingly influenced by Norman architecture. 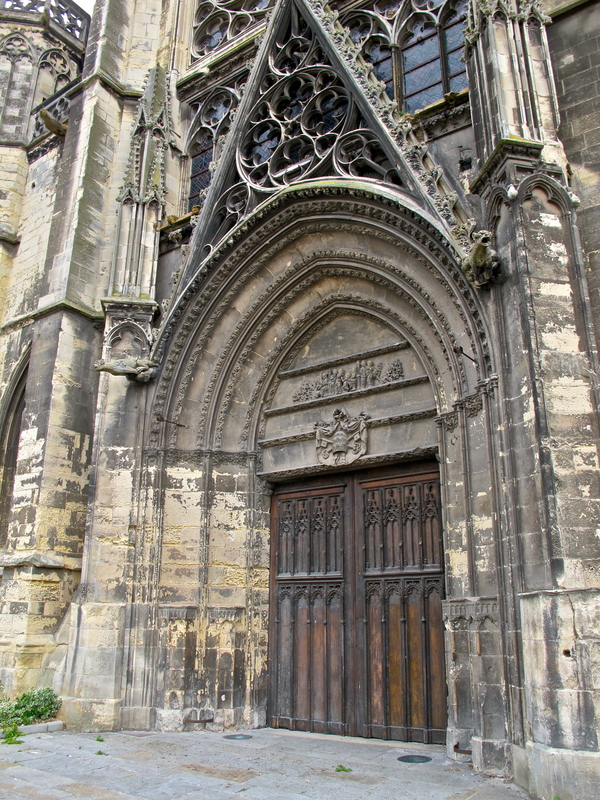 Note that there are three portals leading into the church. This is a very early indication that there are three aisles internally, the nave flanked by side aisles. The main entrance portal has a series of reduplicated arches, indented layer by layer, to provide a feeling of entrance. This does allow us to realize the thickness of the wall into which these arches have been excised. 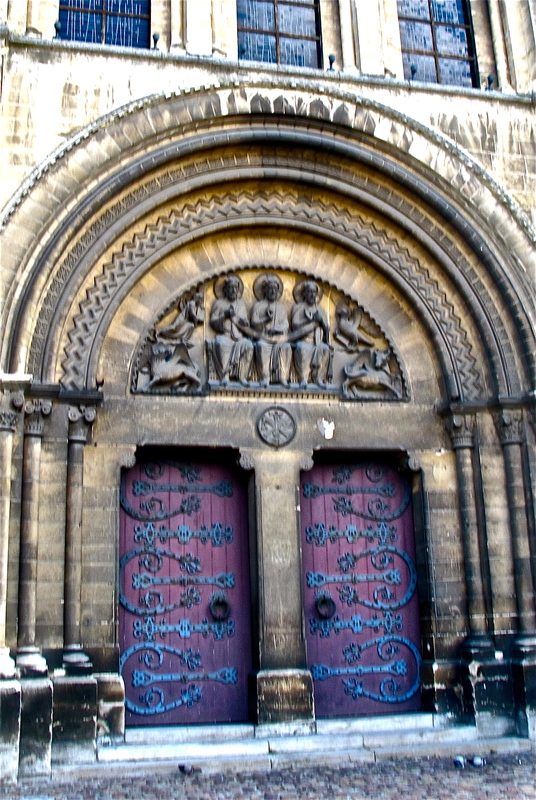 The semi-circular design above the doors represents the Trinity, for which this church is named (La Trinite) – the three figures representing the Trinity, flanked by symbols of the four evangelists (from lower left clockwise): Mark (lion), Mathew (man), John (eagle), and Luke (bull). The walls are short - though for their time, quite normal. 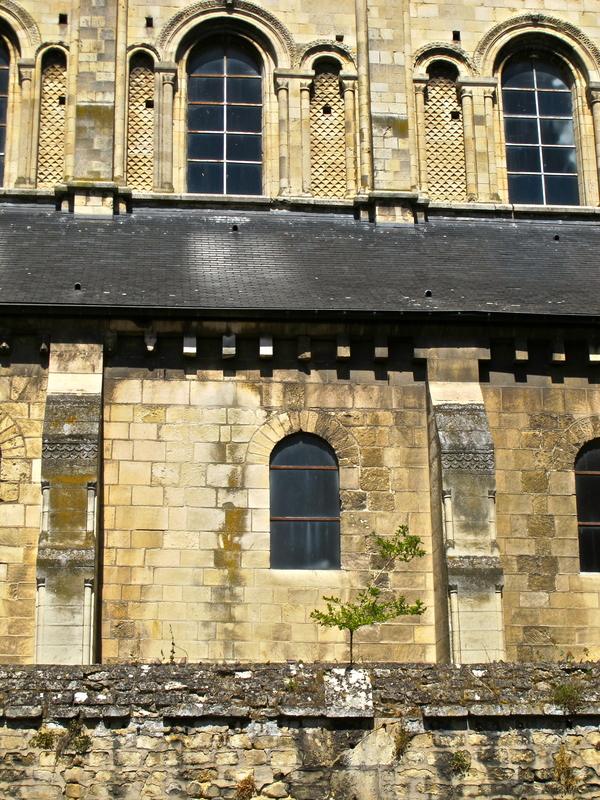 They are, however, supported with protruding right angle pieces of walls; these are the buttresses. And do notice they they get “heavier” or thicker as they approach the ground. And notice also the attention to detail, as tiny pilasters are carved out of their edges, ostensibly to lighten their appearance. Those particular carvings appear at two levels, showing serious consistency, and also a joy in the chisel of the mason who carved those rather precious features. As with most Romanesque churches, the walls are heavy, the openings small. Remember that early church construction was conservative, walls thick and massive and. obviously, the larger the opening the greater the danger of collapse because these churches were supporting heavy stone vaults above. 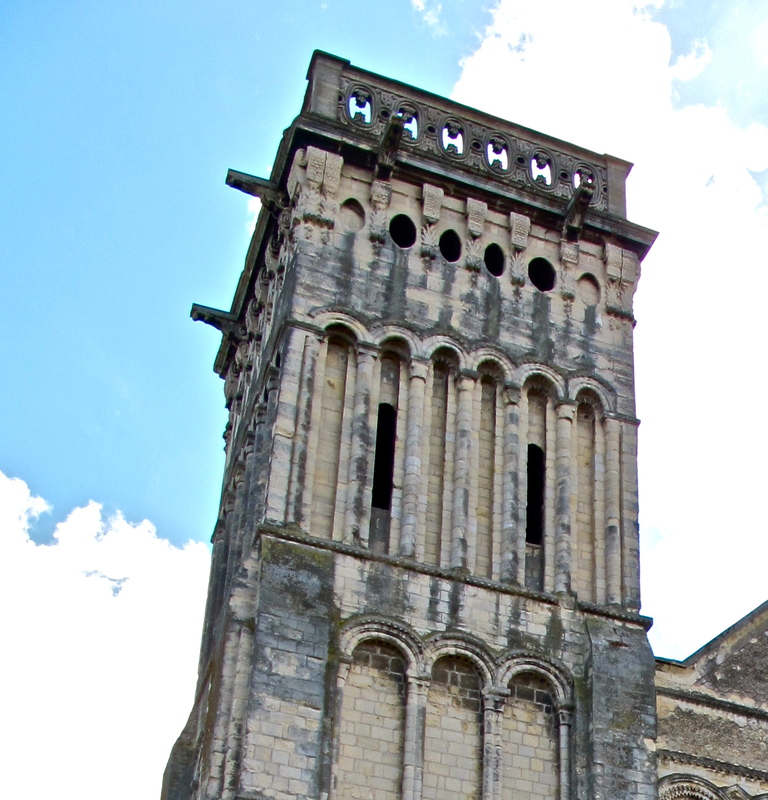 Typical of Norman churches, the central tower over the crossing of the nave and transepts is square in plan. An enlargement of the northwest tower, reveals projections, which basically began as rain spouts, often called “scuppers” today. Here we see those projections on the southwest tower, from the south, behind adjunct church buildings. Though rather crudely portrayed, these projections were to develop into "gargoyles," often hideous portrayals of demons with wide-open mouths. It was getting past these representations of evil that perhaps led to the description of the church itself as a “sanctuary,” an escape from hell itself. 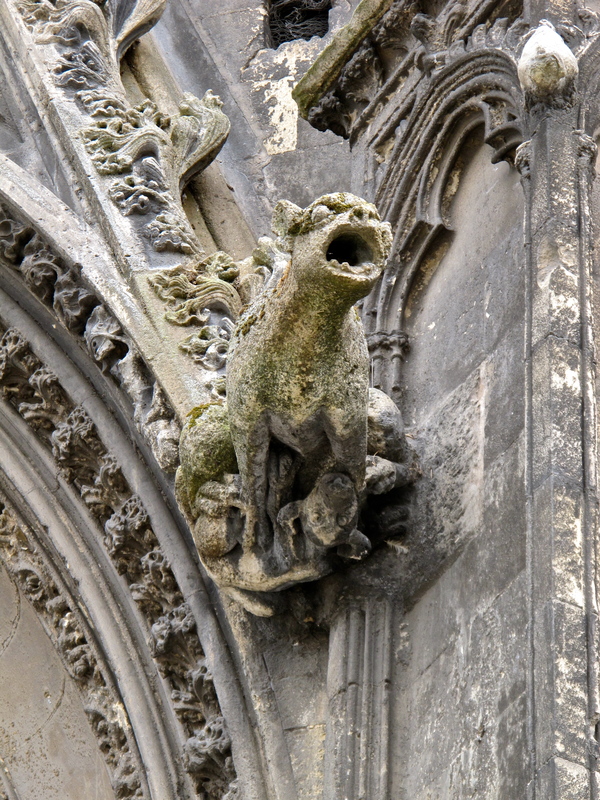 This is a gargoyle, hovering over the entrance to St. Pierre (upper right corner). Actually there are two – one on each corner of the outside jambs. The church is sort of tucked away on the east side of the Caen Castle. Its Gothic origins date from the 13th and 14th centuries, with a Renaissance east end added in the early 16th century. And here a close-up of one of the threatening figures. 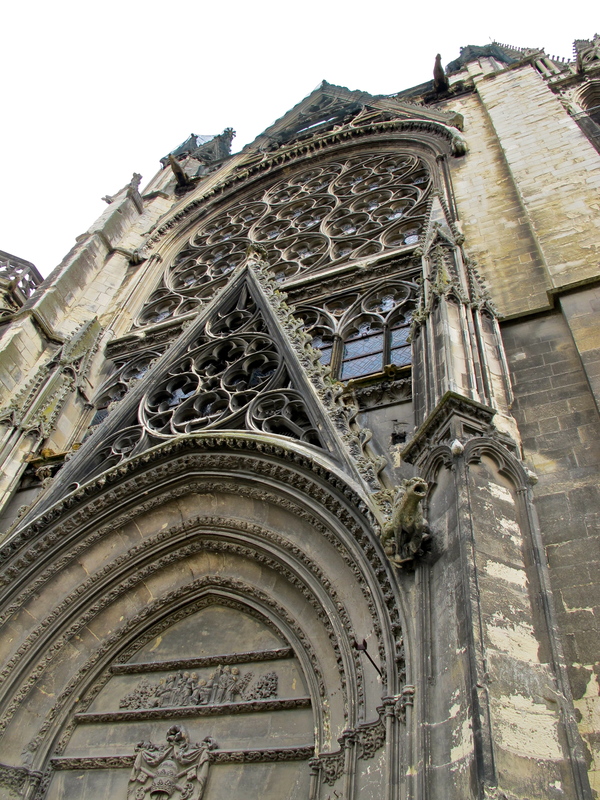 A jump ahead, as we view the round rose window above the entrance to St. Pierre. 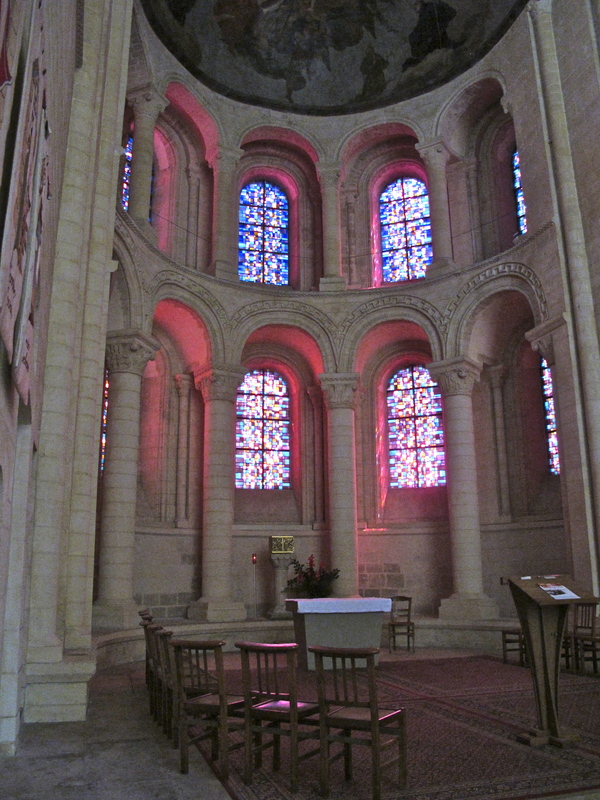 The central semicircular portal, with semi-circular windows above, in the area which will become the rose window, as just glimpsed in St. Pierre above. View just inside the entrance, looking east in the nave towards the apse. The nave roof as we see it today was built in about 1140, and is composed of sexpartite ribbed stone vaults, replacing earlier wood construction. We have already spoken of how it had begun to be obvious that wood roofs attracted lightning, and/or were destroyed by lighting strikes. In order to preserve not only the church but also artifacts and relics of immeasurable wealth - materialistic and spiritual - church roof construction began to be constructed of stone that is more durable. Do note that some of the arches spanning the nave from left to right are filled in, so to speak. See the following illustration for greater clarification. The "sexpartite" means six parts. 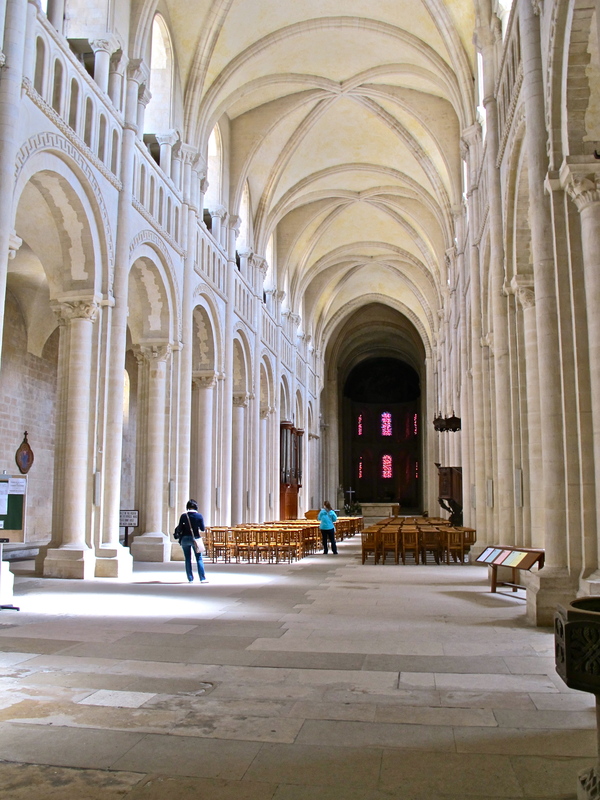 Realize that the nave was usually wider than the side aisles. First of all, that meant that the vault stretching across the nave was taller to accommodate clerestory windows. And secondly, it covered more area than the smaller side aisles required. Those side aisles could be sustained with small square groin vaults. 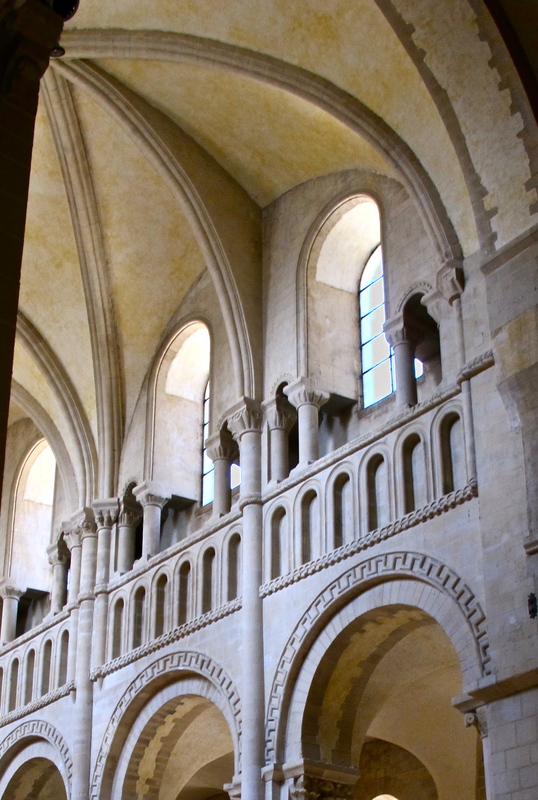 If two little bays of the side aisle equaled one large bay of the nave, sticking a column along the side of the nave, between the larger piers, was awkward in that it only went sideways over the ambulatory. 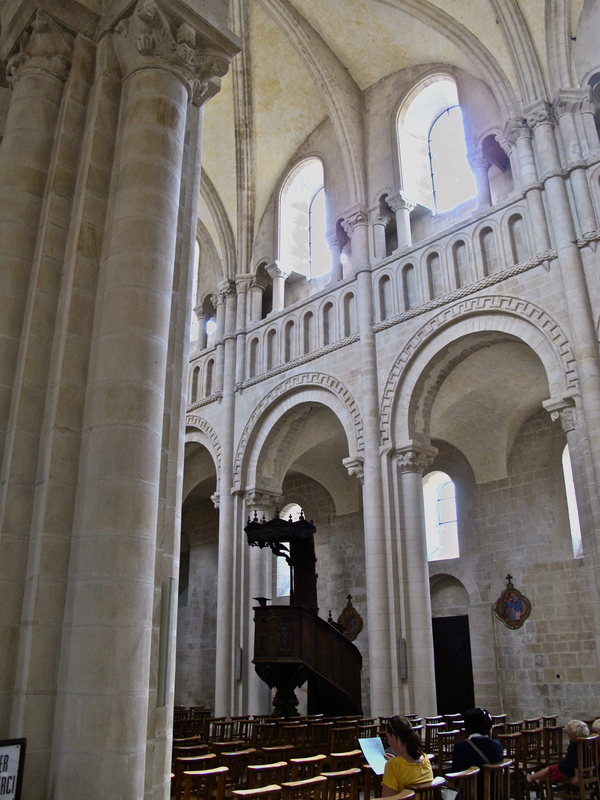 Development here in Caen led to that intermediate column rising full height over the nave, bisecting the tall groin vault, and helping to support it. At the same time, all piers were doing something, and they could be traced up, over, and down the other side of the nave. 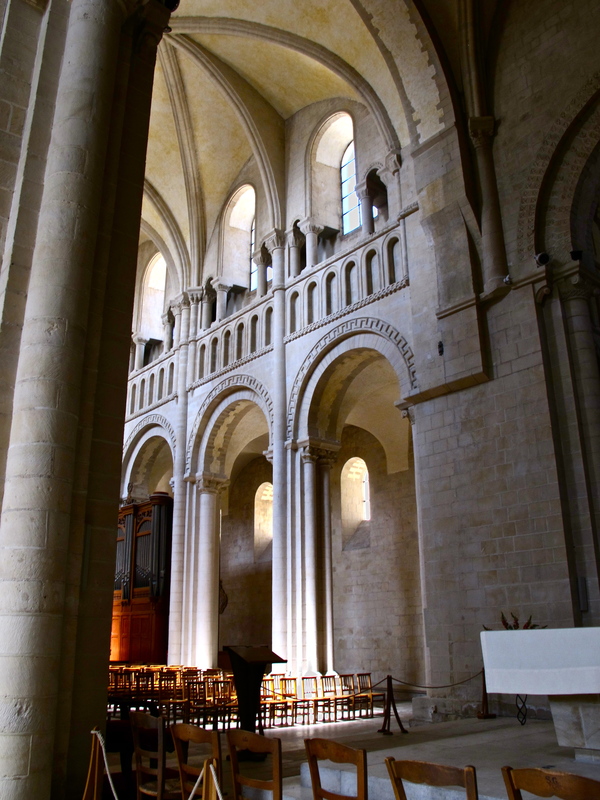 Realize that the main vault is square, bisected by the archway, which involves a column common to the nave and the small side aisle square arches. 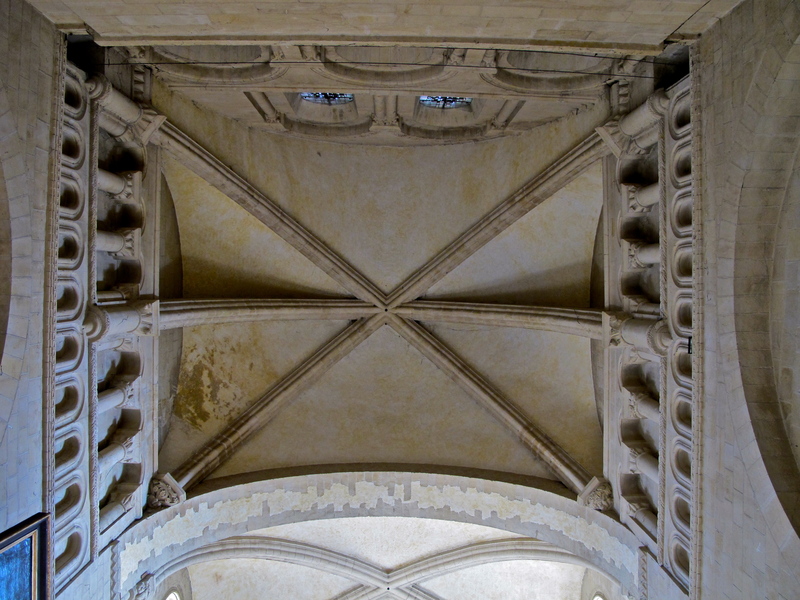 It would not be until the nave vaults became rectangular, that true Gothic development would develop. 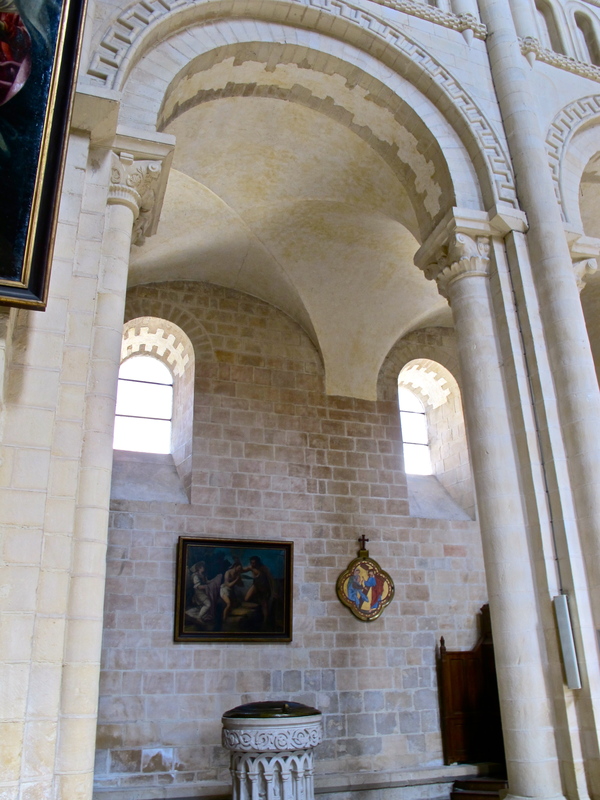 A view of a small square bay over the side aisle – actually a groined vault, with no rib articulation. The unusual fill-in condition, as seen on the other side of the nave, with a bit less glare. Some refer to this as an arch, as opposed to the ribs on either side. A close-up of one of the bays: the sexpartite vault. You can easily count each of the six sections. The altar, with the apse just behind. Within this apse, we see beautifully colored stained glass windows. French churches are noted for their stained glass windows, which were often biblical story-telling for churchgoers who could not read. 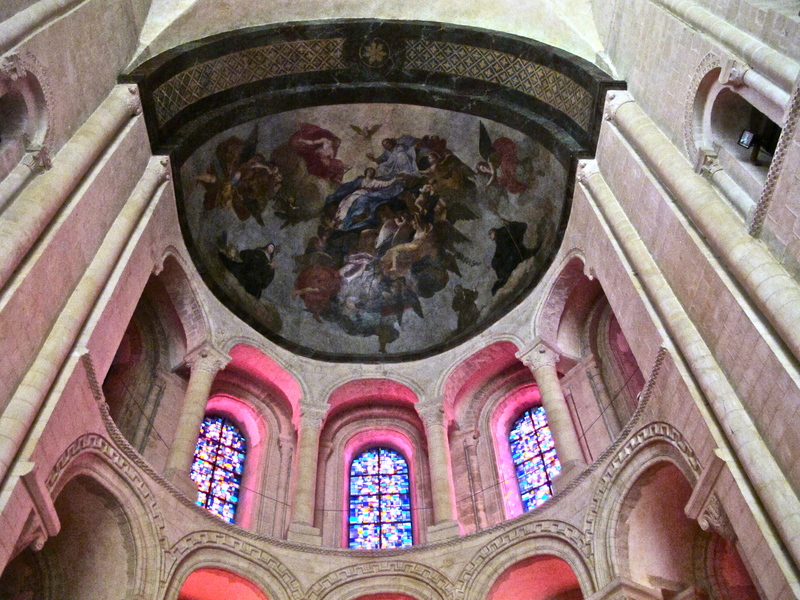 In early Romanesque development, it was common to create a semi-circular apse, an idea taken from earlier basilicas. To accommodate the roof over this area, progressing to stone vaulting, a half-dome was created – the idea goes back, however, to at least Hagia Sophia, which used half-domes to support the main dome; see Chapter 5 above. The nave shows semi-circular arches spanning first level piers, which themselves reveal pilasters applied, to become ribs as they articulate their path of support. Those pilasters run up through an intermediate level, the triforium gallery, shown here as small semi circles applied to a solid face of stone. Articulation is barely evident. What is apparent, however, is the strong emphasis on the springing from the pilaster capitals where the overhead arches begin to arc. Notice how the piers supporting the nave, triforium gallery, and the vaulted ceiling (a later addition replacing the original wooden roof) become quite articulated. What is happening here to architectural developments? First, the division of the pier into readable structural segments, with each rib visually accepting a distinct structural role. Second, a definite almost uninterrupted vertical rising from the floor, soaring up to the vault overhead, then coming down the opposite side. It's this vertical which is to become the hallmark of the Gothic period - the reaching upwards to the sky, the striving to reach the heavens. Here a detail of the “blank” arches of the triforium gallery. It seems there is space behind those small arches, and that they actually form a solid railing. 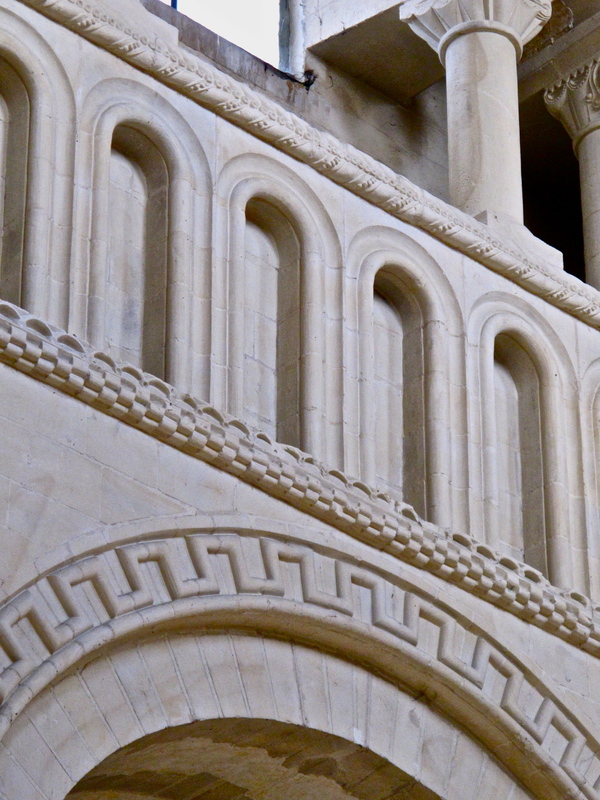 As with all Romanesque construction, arches are semi-circular, in the Roman tradition, thus the name! At some point I am hoping to gain access to that space. See below. Some history texts attributed the precursor of the flying buttress to isolated rib supports within the triforium gallery here at La Trinite. Subsequent site inspection from the floor of the nave seems to invalidate such comments. 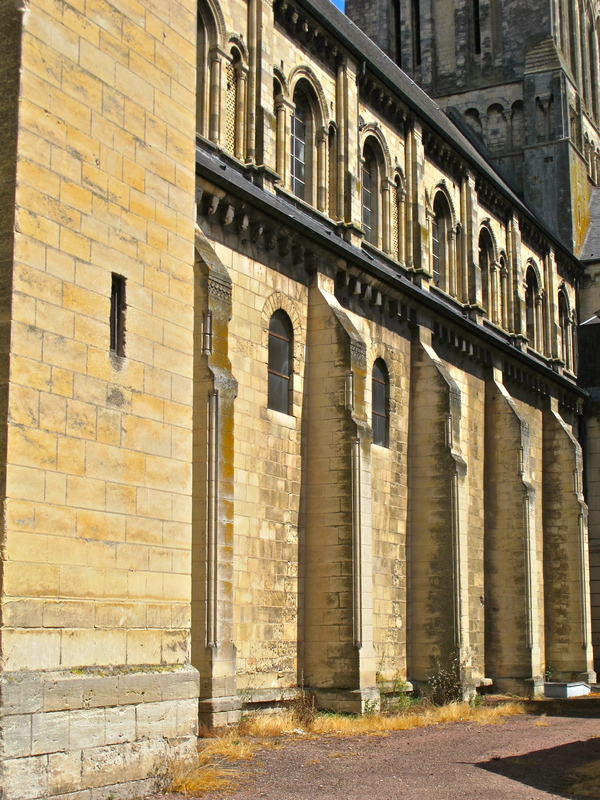 Actual ribbed buttresses do appear in the half-barrel vault of the triforium gallery of the Abbaye-aux-Hommes, on the other side of the city. However, depending upon interpretation, there could be isolated supports under the roof of this triforium gallery, hidden from both internal as well as external observation. Such ribs would have to be located behind the “blind” small arcade and the wall below the clerestory windows. 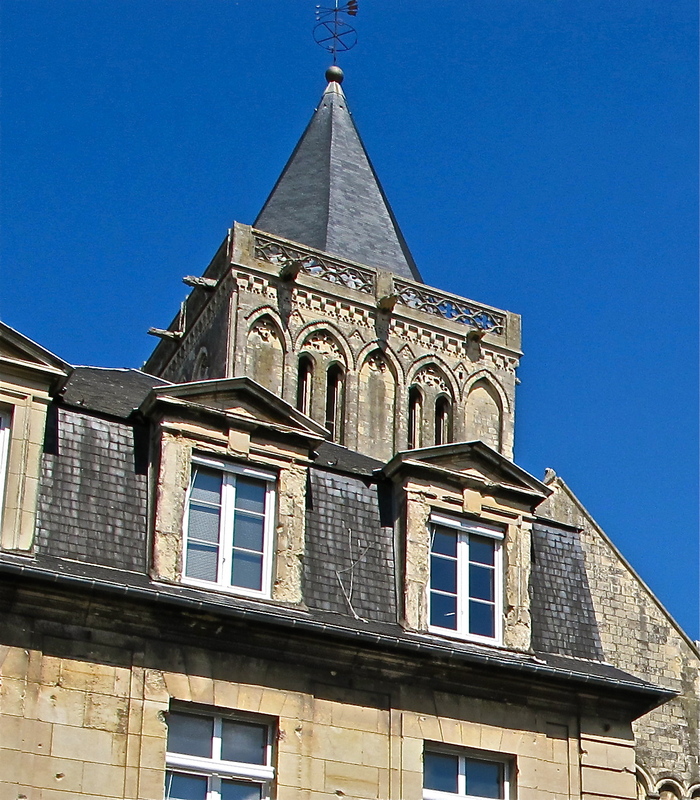 A third visit to the site in the summer of 2011 should reveal the true nature of the construction, and whether or not the very first flying buttresses did, indeed, develop here in the Abbaye aux Dames. The summer of 2010 involved a vain attempt to obtain a key to the stairway leading up to this area. Such key is promised for 2011. For clarification of just what these ribs might be, see the gallery at the Abbaye aux Hommes, immediately below. 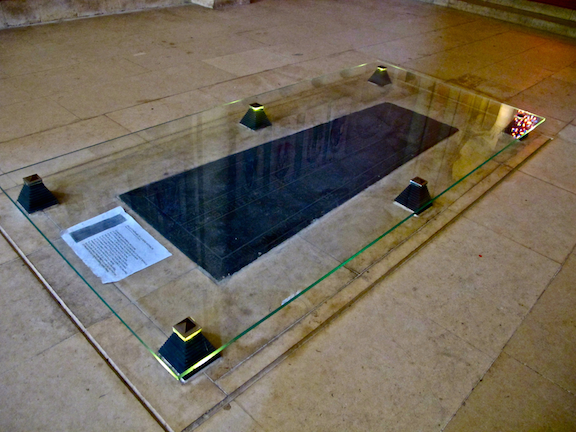 The burial place of Matilda, located between the main altar and the altar situated within the apse, is marked by a black marble slab. 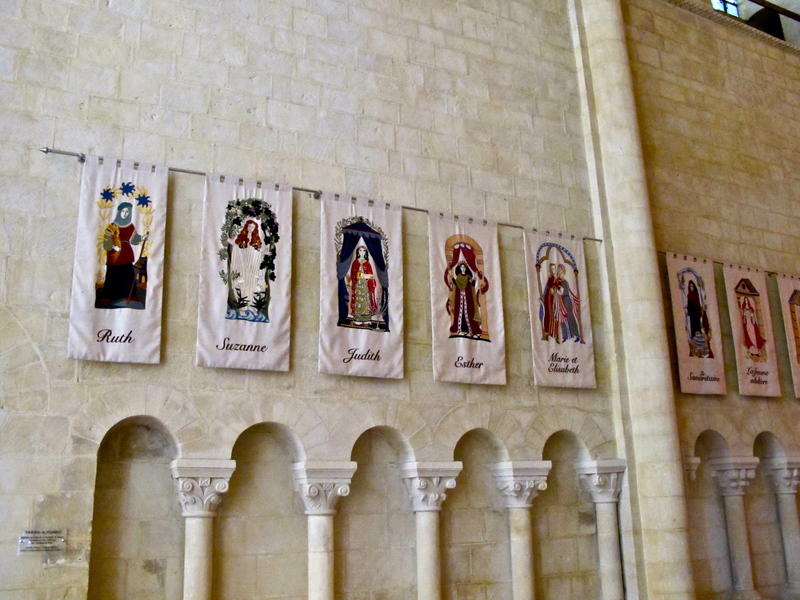 The burial vault is flanked by flags hanging on the walls, each dedicated and marked by the name of a Biblical woman: Ruth, Suzanne, Judith, and Esther, are just a few of the colorful depictions.